the parking garage, with a coffee shop next door and a kids' play area a block away, all at once? What if you could plan a walking tour of all the historic buildings downtown, and in the process discover that there's an ice cream parlor and a pottery shop that you just have to visit along the way? There's a way to do all these things, and it's easier than you think. 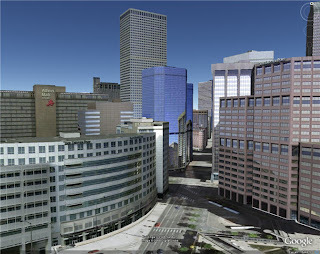 Google Earth has a Photorealistic 3D Buildings layer that you can use to host 3D models of the buildings in your downtown annotated with a wide variety of information that people might find useful. Because it's a full, navigable 3D environment, you can go on a virtual tour and get a much better feel for the city than you might from a traditional map. You can click on a building to pull up an information bubble that might contain anything from descriptions of the stores in the building to photographs of the merchandise to a description of the building itself, its construction date, and architect. You're in control of both the model and the information attached to it; you can update it with links to events happening in the area, sample restaurant menus, or websites associated with a retail store. 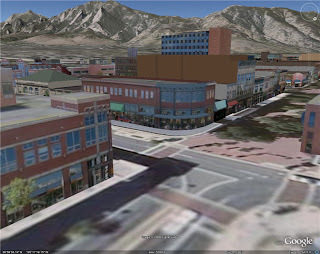 With a complete set of 3D models, you can even use Google Earth for city planning. Is that side street really as pedestrian-friendly as you want it to be? If I approach downtown from this bus stop, do I have a clear idea of where I should go to get to the central square? Apart from the benefits for visitors wanting to search, browse, and explore your city, right now there's an added reason to put your 3D downtown on the map. Photo-textured, publicly-available 3D building models are still novel enough to create buzz, as the city of McMinnville, TN discovered. The idea of using the 3D models as a jumping-off point to a wide variety of content is even more compelling; Walt Disney's recent release of their Orlando theme parks and resorts really shows the potential for interactive models in Google Earth. With the new Google Earth Browser Plugin you can even place tours of your 3D models on your city's website where people explore them without needing a Google Earth client. Your city could be on the leading edge of the virtual tourism market! If you're thinking this sounds good, but difficult and/or expensive, don't fret. There are lots of free tools to get you started. Google SketchUp is an easy-to-use 3D modeling program that you can use to construct the architectural models and apply photographs to them to generate photorealistic buildings. It's free to download, and there are lots of tutorials available to help you learn the program, and specifically to help you construct a model that's optimized for Google Earth. You can then upload your model to the 3D Warehouse, add descriptive information, and mark it for inclusion in the "Photorealistic" 3D Buildings layer in Google Earth. Alternately, your city GIS department may already have models of your downtown that you can start with; or you may want to use some other software package to build your models. If you'd prefer not to upload your models using Google's 3D Warehouse, you can contact the team behind the Cities in 3D program to learn about another way to add your models to Google Earth. Your downtown is so much more than an address listing of the businesses in it. What if there were a way for someone to discover their new favorite bookstore, within easy walking distance of the parking garage, with a coffee shop next door and a kids' play area a block away, all at once? What if you could plan a walking tour of all the historic buildings downtown, and in the process discover that there's an ice cream parlor and a pottery shop that you just have to visit along the way? There's a way to do all these things, and it's easier than you think.